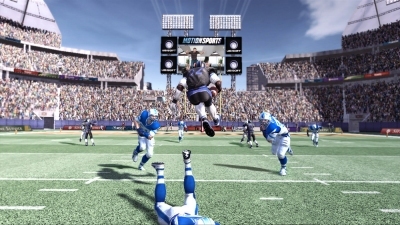 Motion Sports Kinect celebrates hands free gaming by creating an exciting sense of being there in its wide range of events. 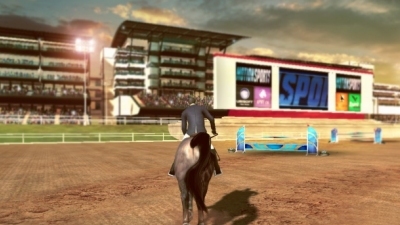 Much more than a party game, Motion Sports offers depth as well as breadth. 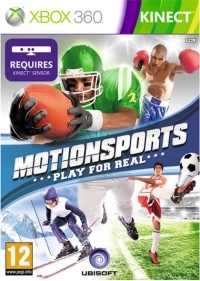 Having been a bit disappointed by the third party Kinect games I'd tried so far I wasn't all that excited by Motion Sports. This wasn't helped by a lacklustre game box that seemed to suggest it was a Wii-style minigame collection. 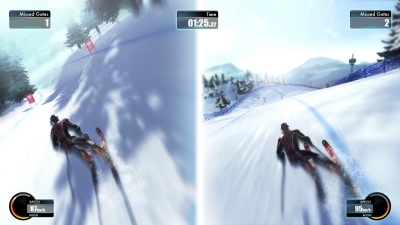 But I had a happy surprise as I discovered Motion Sports to balance realistic visuals and deft use of the Kinect controls. This stems from some sensible decisions that mirror Kinect Sports approach to control feedback. In the majority of events you can see an on-screen avatar (a more realistic version of the official 360 ones) mirror the movements of your arms, legs and torso. It's a minor point but really connects you to the game play. 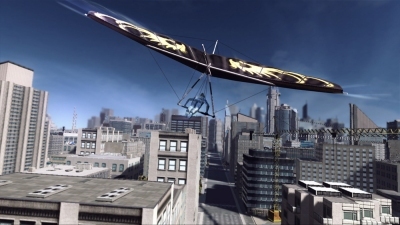 This is complemented by the incorporation of video and images taken via the Kinect camera and placed in the game's environments. Sometimes you can see yourself projected in the background, and at other times plastered over bill boards and newspaper headlines. 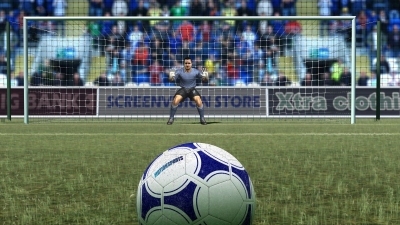 Because of the realistic visuals - think FIFA rather than Wii-Sports - this all fits together really well. The range of activities is at first a little odd - the breadth of coverage is unusual. 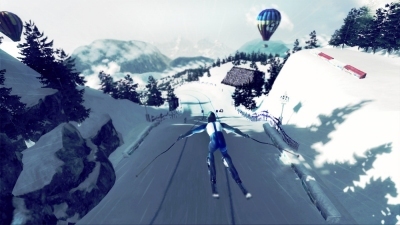 Motion Sports includes Skiing, American Football, Boxing, Hang gliding, Football and Horse Riding. It's a credit to Ubisoft that these are all packaged together rather than split up into four or five different themed releases - which they could conceivably have done. The range on offer meant that each of our family had a favourite. But the quality of each game also meant that we were all keen to play regardless of what the particular sport was. Some of these were a better fit for the Kinect controls than others. Maybe unsurprisingly Boxing and Football struggled to keep up with the simplicity and joy of Hang gliding, Horse Riding and Skiing. 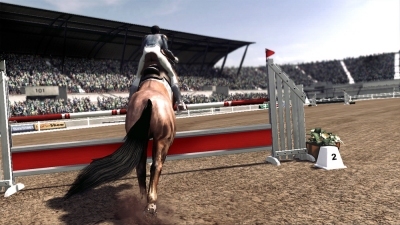 It was the sports that could use Kinect for subtle steering and body position that worked the best. 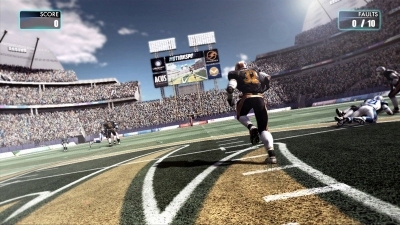 This isn't only the visuals, although they are impressive, but the combination of player movement and the instantaneous in-game response. Skiing and Hang gliding were two stand out events for us, with my daughter also weighing in for Horse Riding. Each of these recreates the real-world event with some accuracy. This isn't only the visuals, although they are impressive, but the combination of player movement and the instantaneous in-game response. Kinect creates a real connection (ed: who'd have thought it) between the player and the game. The result is a game that isn't all that different from what has gone before - both pad controlled 360 titles and gesture controlled Wii/PS3 Move games - but one that feels very different to play. A sense of speed, space and occasion all become contributing elements. It's not until you experience it that you realise just how absent these have been in previous titles. This is all wrapped up in a game that doesn't take itself too seriously. The over the top commentator is particularly good here, and had me laughing more than once at his overblown commentary. Not so good though are the long load times you have to endure between each event and a menu system that is a little too layered. I was never sure quite what was going to happen when picking a particular menu item - would it start the game or would I get to choose players first. I also struggled to find a means of quitting or restarting the current game without picking up a game pad. A sense of speed, space and occasion all become contributing elements. Also on the down side, although Kinect picked up my movements with the usual accuracy, it simply wouldn't register our youngest (3). The older kids (5 and 7) also found it hard to get Motion Sports to recognise their menu selections. Once in game though they could play fine though. None of this is enough to undermine the real joy in a proper grownup set of sports games that put Kinect to such good use. I was starting to wonder if Microsoft had so closely adopted Nintendo's approach to the casual market that they had also created the same quality gap between first the third party games. I'm glad Motion Sports bucks this trend and suggests a greater much more depth of experience is possible with Kinect's controller-less game play.